This will create a asst2_meshedit folder with all the source files. In order to ease the process of running on different platforms, we will be using CMake for our assignments. You will need a CMake installation of version 2.8+ to build the code for this assignment. The GHC 5xxx cluster machines have all the packages required to build the project. It should also be relatively easy to build the assignment and work locally on your OSX or Linux. Building on Windows is currently not supported. When you first run the application, you will see a picture of a mesh made of triangles. The starter code that you must modify is drawing this mesh. The editor already supports some basic functionality, like moving vertices around in space, which you can do by just clicking and dragging on a vertex. You can also rotate the camera by right-clicking and dragging (or dragging on the background), and zoom in and out using the scroll wheel or multi-touch scrolling on a trackpad. Hitting the spacebar will reset the view. As you move the cursor around the screen, you'll notice that mesh elements (faces, edges, and vertices) under the cursor get highlighted. Clicking on one of these elements will display some information about the element and its associated data. (FIRST WEEK) Local resampling - modifies the mesh in a small neighborhood around the currently selected mesh element. (SECOND WEEK) Global resampling - modifies the entire mesh, in an effort to improve the overall quality, size, etc. Each operation will be executed with a key press (see table below). Notice that currently, nothing happens when keys are pressed - this is because you haven't yet implemented resampling! Unlike the previous assignment, no reference solution is provided. However, we will provide several examples of correct input/output pairs for each remeshing operation. Note that each COLLADA file may contain multiple mesh objects; more generally, a COLLADA file describes a scene graph (much like SVG) that is a hierarchical representation of all objects in the scene (meshes, cameras, lights, etc. ), as well as their coordinate transformations. Global resampling methods will be run on whichever mesh is currently selected. A table of all the keyboard controls in the meshedit application is provided below. The assignment is divided into two major components: local operations and global operations; the latter will build on the former (e.g., local edge collapses will ultimately be used for global downsampling). As with the previous assignment, this assignment involves significant implementation effort. Also, be advised that to meet the requirements of later tasks, you should be sure that your local operations handle corner cases; it won't be enough to work only on simple examples! In short: you are highly advised to complete the first component before the midterm, and carefully consider the correctness of your code, since it will be used later for more complicated tasks. Specifically, you should handle corner cases properly in all your edge operations to maintain the manifoldness of the mesh because global operations will depend on the correctness of your local operations. NOTE: The second component (global remeshing) depends on concepts that will be discussed in lectures on geometry processing, so it is not expected that you understand those requirements at the time this assignment is released. Before you start, here are some basic information on the structure of the starter code. Your work will be constrained to implementing part of the classes HalfedgeMesh and MeshResampler in student_code.cpp. Although the halfedge data structure is designed to support general polygon meshes, you can assume that all meshes used in this assignment will be made of triangles only. You can also assume that the input mesh is manifold, possibly with boundary, i.e., that each edge is contained in at most two polygons (or one polygon if it is on the boundary), and each vertex is connected to a single "fan" of triangles. Note that the atomic remeshing operations (split, collapse, and flip) are supposed to preserve the manifold property of the mesh---but it is only your own implementation that can provide this guarantee! In other words, if you make a mistake in one of the local remeshing operations, it can cause trouble for other routines later down the line (probably causing your program to crash!). For simple mesh operations (e.g., loading a mesh from disk and drawing it on screen), one can use a very simple mesh data structure like polygon soup, i.e., just a list of vertices together with a list of polygons connecting them. For many geometry processing tasks, however, this simple representation is no longer sufficient (or leads to unnecessarily bad asymptotic performance). In this assignment, we use the halfedge data structure, which provides a good tradeoff between simplicity and sophistication. 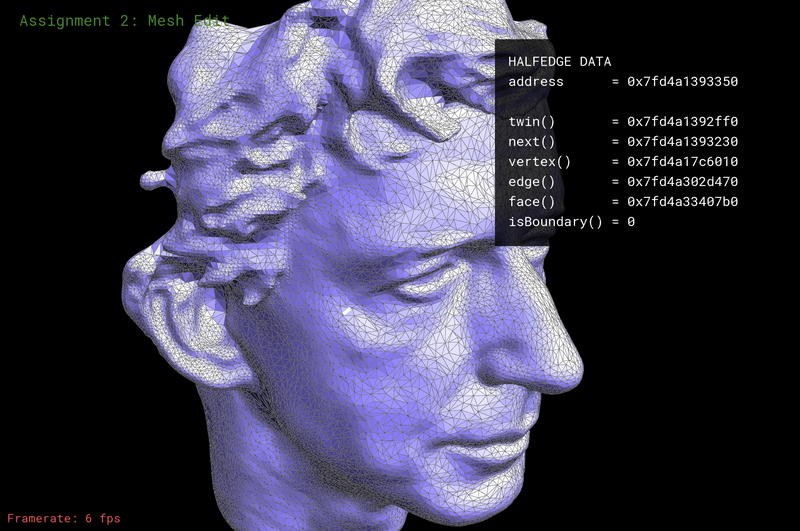 The basic idea behind the halfedge data structure is that, in addition to the usual vertices, edges, and faces that make up a polygon mesh, we also have an entity called a halfedge that acts like a "glue" connecting the different elements. It is this glue that allows us to easily navigate the mesh. In particular, there are two halfedges associated with each edge (see picture above). For an edge connecting two vertices i and j, one of its halfedges points from i to j; the other points from j to i. In other words, we say that the two halfedges are oppositely oriented. One of the halfedges is associated with the face to the "left" of the edge; the other is associated with the face to the "right." Each halfedge knows about the opposite halfedge, which we call its twin. It also knows about the next halfedge around its face, as well as its associated edge, face, and vertex. In contrast, the primitive mesh elements (vertices, edges, and faces) know about only one of their halfedges. 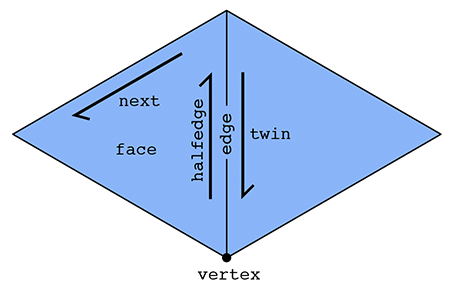 In particular: a vertex knows about one of its "outgoing" halfedges; an edge knows about one of its two halfedges; and a face knows about one of the halfedges circulating around its interior. (Can you easily do this traversal with a polygon soup? Why or why not?) In some sense, a halfedge mesh is kind of like a linked list on steroids. For instance, the halfedges around a given face (connected by next pointers) form a sort of "cyclic" linked list, where the tail points back to the head. An interesting consequence of the halfedge representation is that any valid halfedge mesh must be manifold and orientable. In this assignment, we will therefore only provide manifold, oriented meshes as input (in fact, the parser will complain if the input does not satisfy these criteria). 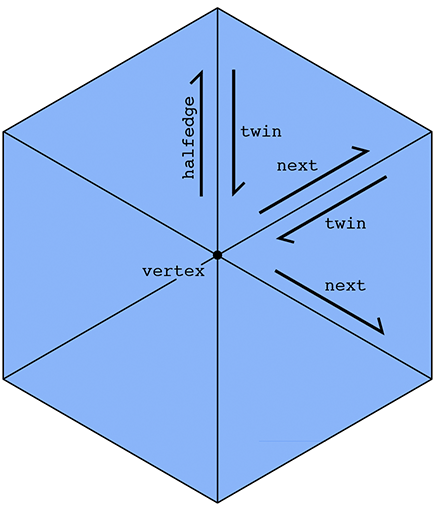 VertexCIter v = h_twin->vertex(); // vertex is 'source' of the half edge. // whereas h_twin->vertex() is the neighbor vertex. h = h_twin->next(); // move to the next outgoing halfedge of the vertex. Likewise, if we delete a mesh element, we must be certain that no existing elements still point to it; the halfedge data structure does not take care of these relationships for you automatically. In fact, that is exactly the point of this assignment: to get some practice directly manipulating the halfedge data structure. Being able to perform these low-level manipulations will enable you to write useful and interesting mesh code far beyond the basic operations in this assignment. Finally, the boundary of the surface (e.g., the ankles and waist of a pair of pants) requires special care in our halfedge implementation. At first glance, it would seem that the routine printNeighborPositions() above might break if the vertex v is on the boundary, because at some point we worry that we have no twin() element to visit. Fortunately, our implementation has been designed to avoid this kind of catastrophe. In particular, rather than having an actual hole in the mesh, we create a "virtual" boundary face whose edges are all the edges of the boundary loop. This way, we can iterate over boundary elements just like any other mesh element. If we ever need to check whether an element is on the boundary, we have the methods. These virtual faces are not stored in the usual face list, i.e., they will not show up when iterating over faces. Please refer to the inline comments (or the Doxygen documentation) for further details. Ignore requests to flip boundary edges (just return immediately if either neighboring face is a boundary loop). Ignore requests to perform any edge flip that would make the surface non-manifold or otherwise invalidate the mesh. Perform only a constant amount of work---the cost of flipping a single edge should not be proportional to the size of the mesh! Not add or delete any elements. Since there are the same number of mesh elements before and after the flip, you should only need to reassign pointers. Draw a picture and/or write down a list of all the elements (vertices, edges, faces, halfedges) that will be needed from the original mesh. Draw a picture and/or write down a list of all the elements that should appear in the modified mesh. Allocate any new elements that are needed in the modified mesh, but do not appear in the original mesh. For every element in the "modified" picture, set all of its pointers---even if they didn't change. For instance, for each halfedge, make sure to set next, twin, vertex, edge, and face to the correct values in the new (modified) picture. For each vertex, make sure to set its halfedge pointer. Etc. A convenience method Halfedge::setNeighbors() has been created for this purpose. Deallocate any elements that are no longer used in the modified mesh, which can be done by calling HalfedgeMesh::deleteVertex(), HalfedgeMesh::deleteEdge(), etc. Define and implement a "generalized edge flip" for faces that are not triangles. One natural generalization is to move each edge endpoint counter-clockwise around the boundary of the union of the two neighboring faces. Determine the precise conditions under which an edge flip will preserve manifoldness, and write a formal proof showing that these conditions are indeed necessary and sufficient. Ignore requests to split boundary edges (just return immediately if either neighboring face is a boundary loop). Assign the position of the new vertex to the midpoint of the original edge, i.e., the average of its two endpoints (see Vertex::position). Perform only a constant amount of work---the cost of splitting a single edge should not be proportional to the size of the mesh! Allocate only as many new elements as needed; there should be no "orphaned" elements that are not connected to the rest of the mesh. Preserve the manifoldness and validity of the mesh. This time around, preserving manifoldness is straightforward since an edge split doesn't change the topology of the underlying surface (however, you should still be careful to point all your pointers at the right elements!). To obtain a correct implementation, you might try following the same "recipe" given in the previous task (though clever, clean, and simple alternatives are of course always welcome). To verify that your implementation works correctly, try flipping some edges that you've split, and splitting some edges that you flipped. Split boundary edges by splitting the interior face and adding a single vertex to the boundary face (see Face::isBoundary()). 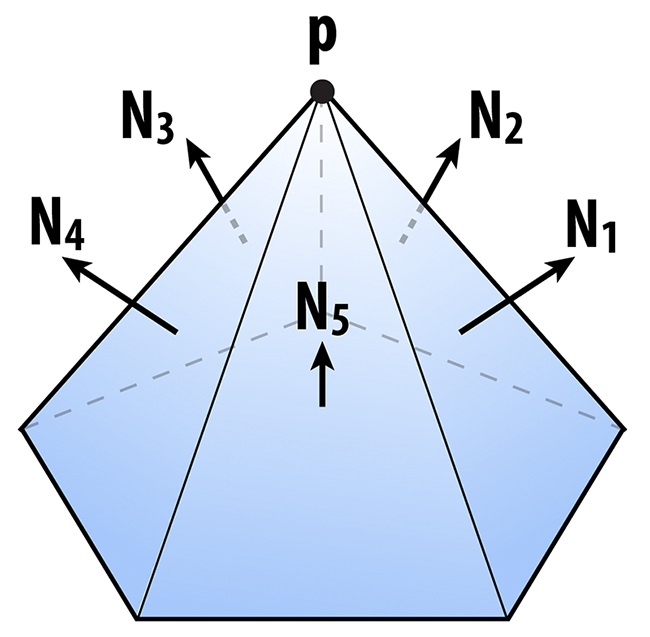 Implement edge split for general polygons, rather than just triangles. Implement vertex split, which is essentially the inverse of the edge collapse you'll implement in the next task. Ignore requests to collapse boundary edges (just return immediately if either neighboring face is a boundary loop). Assign the position of the collapsed vertex to the midpoint of the original edge. Perform only a constant amount of work---the cost of collapsing a single edge should not be proportional to the size of the mesh! Implement edge collapse for general polygonal meshes (instead of just triangles). Determine the precise conditions under which an edge collapse will preserve manifoldness, and write a formal proof showing that these conditions are indeed necessary and sufficient. Collapse boundary edges by collapsing the interior triangle and removing the collapsed edge from the boundary loop. The three local remeshing operations split, collapse, and flip are effectively small steps toward upsampling, downsampling, and resampling the surface. In the second half of the assignment, you will combine these operations in various ways to perform a global remeshing of the surface. You can complete the following tasks in any order; they do not depend on each-other. HalfedgeMesh::splitEdge() - This method should now return a VertexIter pointing to the newly inserted edge midpoint. The halfedge of this vertex should point to one of the halfedges along the edge that was split (rather than the newly inserted edges). This convention will make it easier to implement subdivision. HalfedgeMesh::collapseEdge() - This method should now return a VertexIter pointing to the new vertex, corresponding to the collapsed edge. Having a pointer to this value will make it easier to implement quadric error simplification. HalfedgeMesh::flipEdge() - This method should now return an EdgeIter pointing to the edge that was flipped (rather than void). In principle, this edge should be the same as the argument to flipEdge(); adding this convention simply makes the interface to these methods more uniform (and is perhaps useful in the future). In image processing, we often have a low resolution image that we want to display at a higher resolution. Since we only have a few samples of the original signal, we need to somehow interpolate or upsample the image. One idea would be to simply cut each pixel into four, leaving the color values unchanged, but this leads to a blocky appearance. Instead we might try a more sophisticated scheme (like bilinear or trilinear interpolation) that yields a smoother appearance. 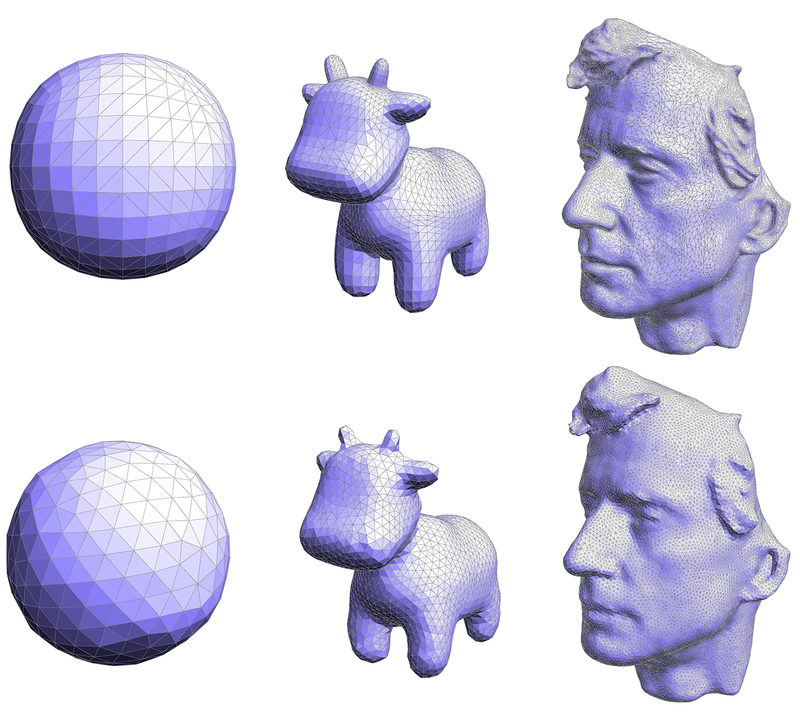 In geometry processing, one encounters the same situation: we may have a low-resolution polygon mesh that we wish to upsample for display, simulation, etc. Simply splitting each polygon into smaller pieces doesn't help, because it does nothing to alleviate blocky silhouettes or chunky features. Instead, we need an upsampling scheme that nicely interpolates or approximates the original data. Polygon meshes are quite a bit trickier than images, however, since our sample points are generally at irregular locations, i.e., they are no longer found at regular intervals on a grid. Split each triangle into four by connecting edge midpoints (sometimes called "4-1 subdivision"). Update vertex positions as a particular weighted average of neighboring positions. In words, the new position of an old vertice is (1 - nu) + u times the sum of the positions of all of its neighbors. The new position for a newly created vertex v that splits Edge AB and is flanked by opposite vertices C and D across the two faces connected to AB in the original mesh will be 3/8 * (A + B) + 1/8 * (C + D). Split every edge of the mesh in any order whatsoever. Flip any new edge that touches a new vertex and an old vertex. Note: Every original edge will now be represented by 2 edges, you should not flip these edges, because they are always already along the boundary of the 4 way divided triangles. In the diagrams below, you should only flip the blue edges that connect an old and new vertex, but you should not flip any of the black new edges. // get the next edge NOW! // ...we still have a valid reference to the next edge. Note that this loop is just one example---in general, you should think about which elements might be affected by a local mesh operation when writing your loops. Likewise, you can make life easier on yourself by making sure that your atomic edge operations provide certain guarantees. For instance, if your implementation of HalfedgeMesh::flipEdge() guarantees that no edges will be created or destroyed (as it should), then you can safely do edge flips inside a loop without worrying about these kinds of side effects. Vertex::newPosition can be used as temporary storage for the new position (computed via the weighted average above). Note that you should not change the value of Vertex::position until all the new vertex positions have been computed---otherwise, you are taking averages of values that have already been averaged! Likewise, Edge::newPosition can be used to store the position of the vertices that will ultimately be inserted at edge midpoints. Again, these values should be computed from the original values (before subdivision), and applied to the new vertices only at the very end. The Edge::newPositionvalue will be used for the position of the vertex that will appear along the old edge after the edge is split. We precompute the position of the new vertex before splitting the edges and allocating the new vertices because it is easier to tansverse the simpler original mesh to find the positions for the weighted average that determines the positions of the new vertices. Vertex::isNew can be used to flag whether a vertex was part of the original mesh, or is a vertex newly inserted by subdivision (at an edge midpoint). Edge::isNew likewise flags whether an edge is a piece of an edge in the original mesh, or is an entirely new edge created during the subdivision step. Mark all vertices as belonging to the original mesh by setting Vertex::isNew to false for all vertices in the mesh. Compute updated positions for all vertices in the original mesh using the vertex subdivision rule, and store them in Vertex::newPosition. Compute new positions associated with the vertices that will be inserted at edge midpoints, and store them in Edge::newPosition. Split every edge in the mesh, being careful about how the loop is written. In particular, you should make sure to iterate only over edges of the original mesh. Otherwise, you will keep splitting edges that you just created! Flip any new edge that connects an old and new vertex. Finally, copy the new vertex positions (Vertex::newPosition) into the usual vertex positions (Vertex::position). You might try implementing this algorithm in stages, e.g., first see if you can correctly update the connectivity, then worry about getting the vertex positions right. Some examples below illustrate the correct behavior of the algorithm. Support surfaces with boundary. For this you will need to make sure your edge split operation appropriately handles boundary edges. You will also need to use a different weighted average for boundary vertices; see Boier-Martin et al, "A Survey of Subdivision-Based Tools for Surface Modeling" for more information. Implement additional subdivision schemes. There are many alternatives to Loop subdivision. Triangle subdivision schemes include Butterfly and modified Butterfly (which are interpolating rather than approximating) and Sqrt(3) (which refines the mesh at a "slower" rate); the most popular subdivision scheme for quadrilateral meshes is Catmull-Clark. 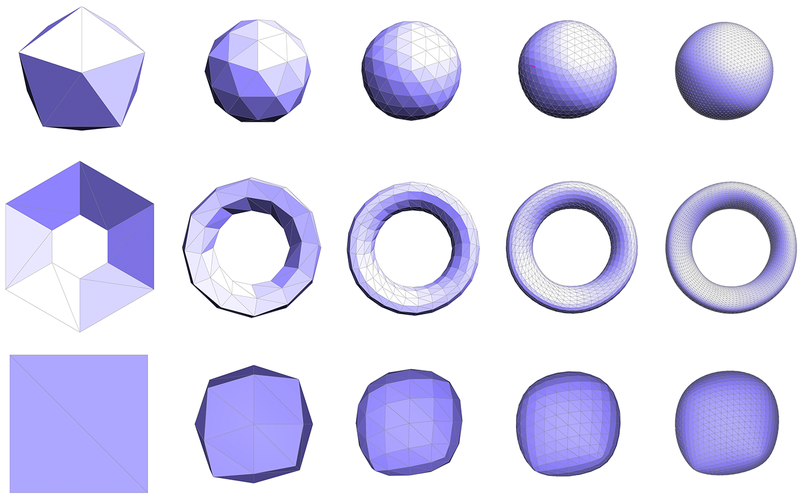 There are also special subdivision schemes for handling meshes with high degree vertices, e.g., extraordinary vertices, called polar subdivision. Implement additional subdivision features. You may have noticed that subdivision generally makes the surface smoother, but of course some surfaces have sharp features that you might like to preserve. 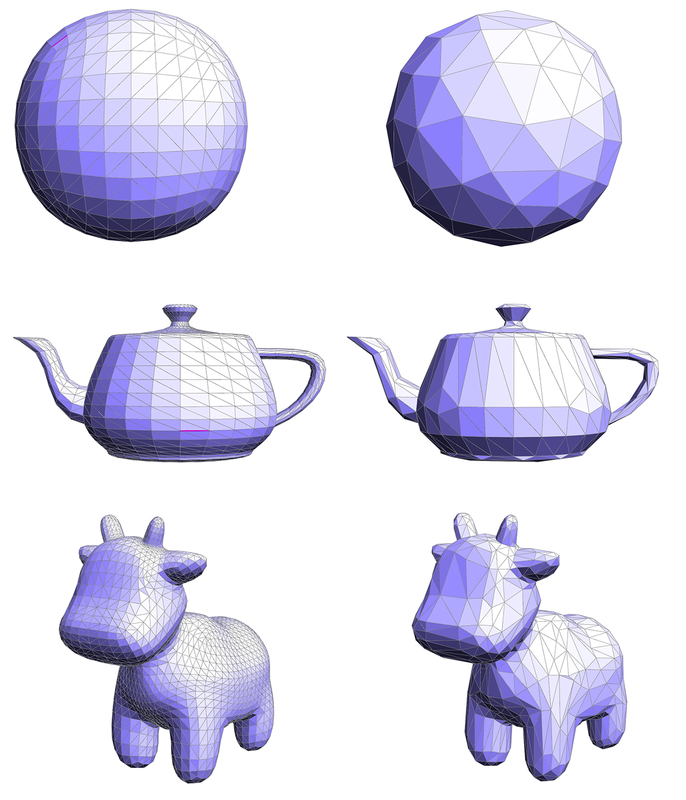 Pixar's OpenSubdiv page describes several features of subdivision surfaces you might add to your implementation. Implement displacement mapping. One reason subdivision surfaces are often used in practice is that they lend themselves nicely to adding lots of geometric detail, via a special texture map called a displacement map. In a nutshell, the fine-level vertices get offset by an amount that is dictated by a bitmap image rather than a fixed subdivision rule. See for instance this paper. The basic idea is to iteratively collapse edges until we reach the desired number of triangles. The more edges we collapse, the simpler the mesh becomes. The only question is: which edges should we collapse? And where should we put the new vertex when we collapse an edge? Finding the sequence of edge collapses (and vertex positions) that give an optimal approximation of the surface would be very difficult---likely impossible! Garland and Heckbert instead proposed a simple, greedy scheme that works quite well in practice, and is the basis of many mesh simplification tools today. Roughly speaking, we're going to write down a function that measures the distance to a given triangle, and then "accumulate" this function as many triangles get merged together. but in our code framework you can simply compute it using the method outer( Vector4D, Vector4D ) in matrix4x4.h that takes a pair of vectors in homogeneous coordinates and returns the outer product as a 4x4 matrix. We will refer to this matrix as a "quadric," because it also describes a quadric surface. K_i = (sum over all faces ijk touching vertex i) K_ijk. K_ij = K_i + K_j. In your code, we have added a member Matrix4x4 Face::quadric and Matrix4x4 Vertex::quadric to the faces and vertices of the halfedge mesh. The sums above should then be easy to compute--you can just add up the Matrix4x4 objects around a vertex or along an edge using the usual "+" operator. You do not need to write an explicit loop over the 16 entries of the matrix. for each edge, we want to find the point that is (roughly) as close as possible to the surface, according to the matrices at its endpoints. As we collapse edges, the matrices at endpoints will be combined by just adding them together. So, as we perform more and more edge collapses, these matrices will try to capture the distance to a larger and larger region of the original surface. // that we need while applying our mesh simplification algorithm. // optimal midpoint position as measured by this quadric. // It also stores the value of this quadric as the "score"
// used by the priority queue. More documentation is provided in the header file MutablePriorityQueue.h. Compute a quadric for the edge as the sum of the quadrics at endpoints. Build a 3x3 linear system for the optimal collapsed point, as described above. Solve this system and store the optimal point in EdgeRecord::optimalPoint. Compute the corresponding error value and store it in EdgeRecord::cost. Store the edge in EdgeRecord::edge. Compute quadrics for each face by simply writing the plane equation for that face in homogeneous coordinates, and building the corresponding quadric matrix using Matrix4x4::outer(). This matrix should be stored in Face::quadric. For each edge, create an EdgeRecord and insert it into one global MutablePriorityQueue. Until a target number of triangles is reached, collapse the best/cheapest edge (as determined by the priority queue), and set the quadric at the new vertex to the sum of the quadrics at the endpoints of the original edge. You will also have to update the cost of any edge connected to this vertex. The algorithm should terminate when a target number of triangles is reached---for the purpose of this assignment, you should set this number to 1/4th the number of triangles in the input (since subdivision will give you a factor of 4 in the opposite direction). Note that to get the best element from the queue you call MutablePriorityQueue::top(), whereas to remove the best element from the top you must call MutablePriorityQueue::pop() (the separation of these two tasks is fairly standard in STL-like data structures). Get the cheapest edge from the queue. Remove the cheapest edge from the queue by calling pop(). Compute the new quadric by summing the quadrics at its two endpoints. Remove any edge touching either of its endpoints from the queue. Set the quadric of the new vertex to the quadric computed in Step 2. Insert any edge touching the new vertex into the queue, creating new edge records for each of them. Note: Step 2 is highlighted, because these instruction used to erroneously recommend that the pop be done at the end. The pop of the cheapest edge needs to occur before any modifications are made to the queue, because otherwise the edge you are processing might not be the cheapest edge at the end of the 7 step process. Steps 4 and 7 are highlighted because it is easy to get these steps wrong. For instance, if you collapse the edge first, you may no longer be able to access the edges that need to be removed from the queue. A working implementation should look something like the examples below. You may find it easiest to implement this algorithm in stages. For instance, first get the edge collapses working, using just the edge midpoint rather than the optimal point, then worry about solving for the point that minimizes quadric error. The original quadric error algorithm allowed not only edge collapses, but arbitrary vertex pair collapses, i.e., two vertices on different connected components of a surface could be joined together. This allows large, complicated meshes with many pieces to be approximated as just a few simple pieces---for instance, a bag of popcorn can be approximated by a continuous surface (useful for rendering from afar!). Can you augment your existing implementation to allow for arbitrary vertex pairs? In this assignment, we only focus on simplifying the geometry. What if our mesh has other data associated with it (texture, color, etc.)? One can apply similar methods to simplify this richer data as well, basically by incorporating these additional attributes into the quadric. Iterative edge collapse is not the only way to get a simplified approximation of a surface. A very different approach is variational shape approximation (VSA), which globally solves for a collection of planes that approximate the surface. If an edge is too long, split it. If an edge is too short, collapse it. If flipping an edge improves the degree of neighboring vertices, flip it. Move vertices toward the average of their neighbors. Repeating this simple process several times typically produces a mesh with fairly uniform triangle areas, angles, and vertex degrees. However, each of the steps deserves slightly more explanation. Ultimately we want all of our triangles to be about the same size, which means we want edges to all have roughly the same length. As suggested in the paper by Botsch and Kobbelt, we will aim to keep our edges no longer than 4/3rds of the mean edge length L in the input mesh, and no shorter than 4/5ths of L. In other words, if an edge is longer than 4L/3, split it; if it is shorter than 4L/5, collapse it. We recommend performing all of the splits first, then doing all of the collapses (though as usual, you should be careful to think about when and how mesh elements are being allocated/deallocated). We want to flip an edge any time it reduces the total deviation from regular degree (degree 6). In particular, let a1, a2 be the degrees of an edge that we're thinking about flipping, and let b1, b2 be the degrees of the two vertices across from this edge. The total deviation in the initial configuration is |a1-6| + |a2-6| + |b1-6| + |b2-6|. You should be able to easily compute the deviation after the edge flip without actually performing the edge flip; if this number decreases, then the edge flip should be performed. We recommend flipping all edges in a single pass, after the edge collapse step. Finally, we also want to optimize the geometry of the vertices. A very simple heuristic is that a mesh will have reasonably well-shaped elements if each vertex is located at the center of its neighbors. To keep your code clean and simple, we ask that you implement the method Vertex::computeCentroid() which should compute the average position of the neighbors and store it in the member Vertex::centroid. The reason this value must be stored in a temporary variable and not immediately used to replace the current position is similar to the reason we stored temporary vertex positions in our subdivision scheme: we don't want to be taking averages of vertices that have already been averaged. Doing so can yield some bizarre behavior that depends on the order in which vertices are traversed (if you're interested in learning more about this issue, Google around for the terms "Jacobi iterations" and "Gauss-Seidel). So, your code should (i) first compute the centroid for all vertices, and (ii) then update the vertices with new positions. where w is some weighting factor between 0 and 1 (we use 1/5 in the examples below). 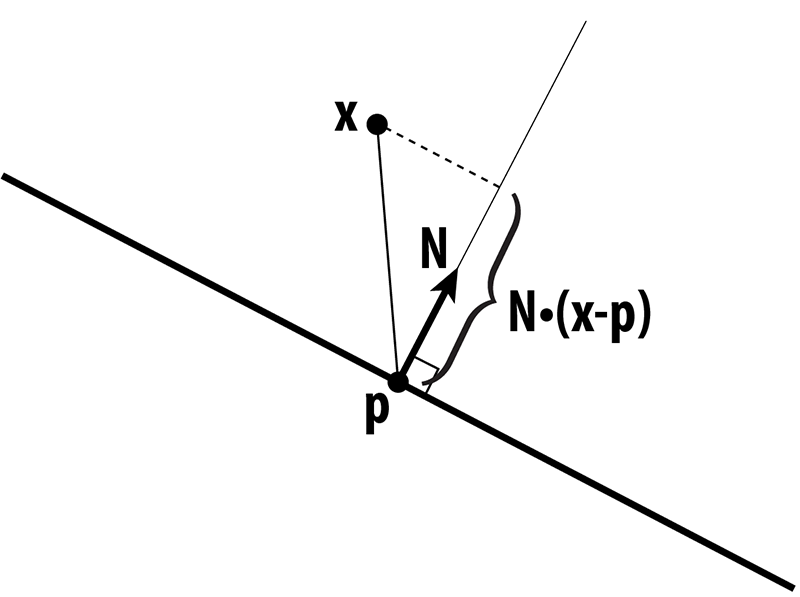 In other words, we start out at p and move a little bit in the update direction v = c-p.
where A_ijk is the area of triangle ijk, and N_ijk is its unit normal; this quantity can be computed directly by just taking the cross product of two of the triangle's edge vectors (properly oriented). Compute the mean edge length L of the input. Split all edges that are longer than 4L/3. Collapse all edges that are shorter than 4L/5. Flip all edges that decrease the total deviation from degree 6. Compute the centroids for all the vertices. Move each vertex in the tangent direction toward its centroid. Repeating this procedure about 5 or 6 times should yield results like the ones seen below; you may want to repeat the smoothing step 10-20 times for each "outer" iteration. What do you think about this algorithm? Does it improve the triangle quality? What about the quality of the geometric approximation? In what situations might this kind of resampling be useful? How might it be improved? As hinted at in the question above, this algorithm doesn't deal too well with geometry that has sharp features and large curvatures. A later method by the same author explored adaptation to curvature. Extend your implementation as described in this paper (or based on your own variation of the method). As a sanity check, each of your resampling algorithms should run almost immediately (no more than a second or two) on the smaller meshes, and it should be possible to complete remeshing on the larger meshes (albeit more slowly!). If performance is significantly worse than this, you may be iterating over more elements than you really need to, or are mismanaging memory. Using the tool you have just implemented, generate the most interesting/fun/creative model you can by combining upsampling, downsampling, and resampling, with the vertex-drag tool. (If you have implemented additional features, you can use these as well.) We'll show off the best results in class later this semester. Your code must run on the GHC 5xxxx cluster machines as we will grade on those machines. Do not wait until the submission deadline to test your code on the cluster machines. Keep in mind that there is no perfect way to run on arbitrary platforms. If you experience trouble building on your computer, while the staff may be able to help, but the GHC 5xxx machines will always work and we recommend you work on them. Each task will be graded on the basis of correctness, except for Task 7 which will be graded (gently) on effort. You are not expected to completely reproduce the reference solution vertex-for-vertex as slight differences in implementation strategy or even the order of floating point arithmetic will causes differences, but your solution should not be very far off from the provided input/output pairs. If you have any questions about whether your implementation is "sufficiently correct", just ask. Note that you may need to create the asst2 directory yourself. All your files should be placed there. Please make sure you have a directory and are able to write to it well before the deadline; we are not responsible if you wait until 10 minutes before the deadline and run into trouble. Also, you may need to run aklog cs.cmu.edu after you login in order to read from/write to your submission directory. Any additional binary or intermediate files generated in the build process. You should include a README file (plaintext or pdf) if you have implemented any of the extra credit features. In your REAME file, clearly indicate which extra credit features you have implemented. You should also briefly state anything that you think the grader should be aware of. and your code should build correctly. The code must compile and run on the GHC 5xxx cluster machines. Be sure to check to make sure you submit all files and that your code builds correctly. As always, start early. There is a lot to implement in this assignment, and no official checkpoint, so don't fall behind! Be careful with memory allocation, as too many or too frequent heap allocations will severely degrade performance. Handle all corner cases properly. Otherwise, your task 4 - 6 will probably suffer from segmentation fault a lot. Make sure you have a submission directory that you can write to as soon as possible. Notify course staff if this is not the case. While C has many pitfalls, C++ introduces even more wonderful ways to shoot yourself in the foot. It is generally wise to stay away from as many features as possible, and make sure you fully understand the features you do use. The Half-Edge Data Structure - another tutorial on the halfedge data structure. OpenMesh - a different implementation than the one used in our assignment, but discusses some of the software design challenges associated with building a halfedge data structure. Assignment 2: MeshEdit is maintained by 462cmu. This page was generated by GitHub Pages using the Cayman theme by Jason Long.